Pours a light golden yellow producing a solid two-finger head with off-white frothy consistency. Body produces a lot of carbonation which serves well to hold up the head. Soft lacing clings to the glass and falls away as the head subsides. Crystal clear body has now settled to a light amber color with the slightest tinge of orange. Aroma is light and crisp with soft sweet malt notes with a sugary scent, and shifts to a doughy bread malt aroma with light soapy notes. First taste is slightly bitter up front but eases into a slightly sweet finish with a fairly chewy consistency. Light to medium bodied, it has a slightly creamy texture leaving an oily film with a malty taste and soft carbonation. 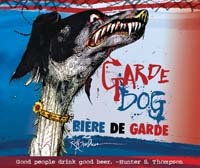 Flying Dog's Garde Dog is a very well balanced beer, perfectly released for the seasonal change in New England with enough of a malt character to ward off the cold, but clean and crisp enough to work on a warm Spring afternoon. Reviewed on April 3rd, 2008.